“This project has given me the opportunity to use whatever modest talents I had to challenge Architecture and Design away from its perceived exclusivity and the notion that inexpensive could not be inventive but only stereo-typically dreadful and bland. Debbas Architecture, led by Charles Debbas, weighed mechanistic modernism against organic spirituality and opted for softly curving architecture that not only speaks of native round hut design, but that is also welcoming and encourages movement and exploration in and around the village, while providing a vivid yet calming language. Rising from the land, the architecture embraces past and present through its simple yet evocative language and natural palette of materials, the most important one being natural light. Inspired by local architecture, art and artisans, the design also draws inspiration from the site’s specific attributes, its proximity to key natural landmarks and the weather conditions. 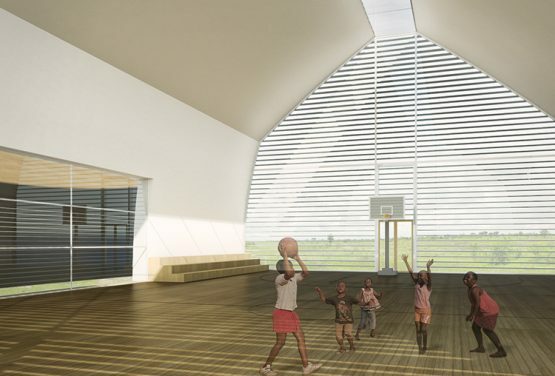 Great attention was given to natural ventilation and natural lighting (which is known to promote good mental health) as well as a number of sustainable solutions for water, power and sanitation. The modular architecture also allows for individualizing the separate buildings to create diversity and in the case of the residences for vulnerable children, a point of reference through different façade colors. The main architectural and structural elements are fabricated off-site and consist of insulated prefabricated panels that make up an inner shell, with a horizontal louver system (made of a wood pattern resin fiberboard) as a secondary outer shell used for natural ventilation. An operable skylight connecting the shells is also used for ventilation and lighting. All window frames consist of clear anodized aluminum for durability and all glass is double glazed and insulated.